Going back to my other thread, I discussed why I converted all the Bloodreavers to wear helmets. So far as the paint colors of choice, I’ve gone ahead and themed them up to match my Age of Sigmar Khorne army – The Bloodskins of the Iron Keep. Again, I plan to write a little more about them in the future, but I’m about six painted models away from being ready for that post. In the meantime, enjoy this colorful take on the Bloodreavers. Hopefully, now in vibrant four-color glory, I can finally win a game! Bloodskins of the Iron Keep! 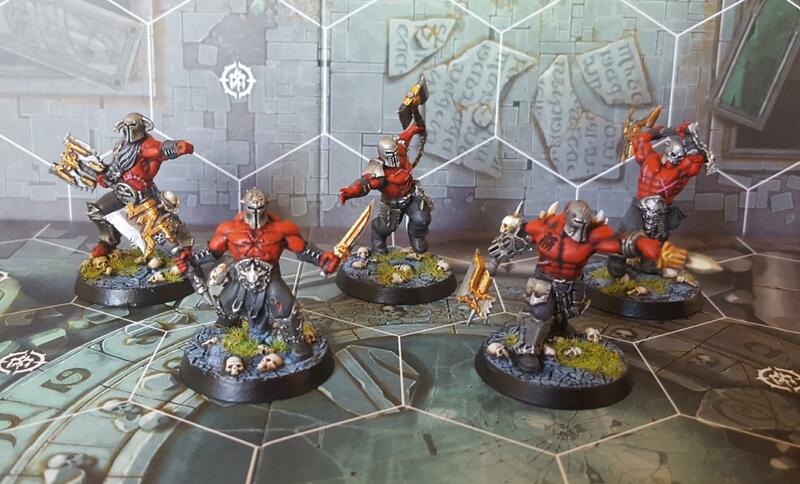 This entry was posted in Age of Sigmar, Gaming, Painting, Shadespire, Warhammer Underworlds and tagged Age of Sigmar, boardgames, Games Workshop, Painting, Shadespire, Warhammer Underworlds by Mr. White. Bookmark the permalink. The helmted heads look great, and a nice crisp paint job as usual. My wife has threatened to buy me some new brushes. Hope it doesn’t impact my style. That’s four colors put to good use Jeff. I wasn’t sure if the helmets were going to work but they look fantastic! ha! Red, grey, steel, gold!